What do you think of the loading speed of your website as a search engine ranking factor? Let us give you a hint: It’s an important one. Google has recently included the loading speed of a website in the list of search engine ranking factors. And in future, we expect it to play an even bigger rule. With technologies like AMP (Accelerated Mobile Pages) gaining more prominence, search engine factors — like the loading speed of your website — that improve the user experience is going to be more important in future. And yes, that’s the key: User Experience. We believe that any factor that improves user experience is going to be very important for search engines, and the loading speed of a website greatly affects user experience, traffic views, and even conversions. On average, a 1-second delay means 11% fewer page views, 16% decrement in customer satisfaction, and a 7% drop in conversion rates. 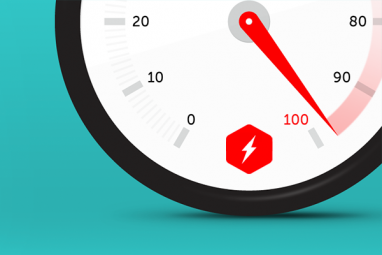 So let’s discuss how you can easily improve the loading speed of your website. Here are a few proven methods by which you can decrease the website loading time. When a webpage is being loaded, an HTTP request is made for each element on the webpage, e.g., images, scripts, Flash, stylesheets, etc. According to a research by Yahoo, approximately 80% of a page’s loading time is spent managing these HTTP requests. So, in summary, the fewer number of webpage elements you have on your website, the fewer HTTP requests will be required. And fewer HTTP requests mean faster websites. To minimize the number of HTTP requests, you can try using CSS instead of images, combining multiple CSS stylesheets into a single stylesheet, avoid using Flash, etc. It is, by far, the quickest and most efficient way to significantly improve the loading speed of your website. In the previous tip, we discussed the importance of having a single CSS stylesheet instead of having multiple stylesheets. There is one more thing that you can do to fully optimize CSS delivery and, therefore, the loading speed of your website. As you know the CSS (Cascading Style Sheet) contains the style requirements of a webpage. This information can be put — and accessed — into two different ways. One way (the more common one) is to have an external CSS sheet and put all the style requirements and codes in that external file. Another method is to have inline CSS. It is inserted directly in the HTML document. Most websites do have an external CSS sheet, but they also have some inline CSS codes. That’s wrong. Inline CSS negatively affects the loading speed of a website and, hence, isn’t recommended. If you are using inline CSS to whatever extent, you can improve the loading speed of your website by moving all those codes into the external CSS sheet. We love plugins, don’t we? They are very user-friendly, provide tons of amazing functionalities, and they are very simple to use for an average non-technical person. It is often observed that a website owner — in an attempt to get more functions at their fingertips — end up installing dozens of plugins. Plugins are awesome, but the only problem is that having too many plugins can drastically slow down your website. Moreover, too many plugins can also create technical and security issues. The tip is to reduce the number of plugins you use and only go for the ones you feel you can’t live without. If it is not absolutely important, let the plugin go and increase your website loading time. Today’s websites use hundreds of images. If you are running an active blog, you would be uploading dozens of new images every month. After all, blog posts with images get 94% more traffic views, and they also improve user-experience and bounce rate. However, a major problem is that the more images you use on your website, the slower it becomes. If you are also stuck with this dilemma, proper image optimization is the answer you are looking for. The first method is to scale the images down before you upload them on the website. Many website owners make this rookie mistake of scaling an image with CSS. It does not matter because the page would be still loading the full image. So, scale an image first, and then upload it on your website. The second method is to use an image compressor. There are many good plugins that do that automatically. TinyPNG and EWWW Image Optimizer are two very good options that you can’t wrong with. When an online visitor lands on your webpage, her browser downloads the elements which are on that webpage. If that person lands again on the same website / webpage, her browser would be downloading all those elements once more. However, if you have enabled browser caching, that wouldn’t be happening. Browser caching enables you to temporarily store data on your website visitor’s computer. So when they land on your website again, they don’t have to download all these elements from the scratch. And when they don’t have to download the elements as if they’re visiting for the first time, the webpage loads pretty quickly. Minification is an important aspect of increasing website loading time. You see, most website owners use WYSIWYG editors to create their website. After all, they are super easy and fun to use. However, despite the numerous benefits of WYSIWYG editors, there are also some negative points. WYSIWYG editors often end up leaving messy codes that slow down your website considerably. If you can minify your resources and clean up those codes, you can speed up your website. PageSpeed Insights is a Google Chrome extension that you can use to minify HTML. For CSS and JS minification, you can use YUI Compressor. Some of the tips mentioned in this article are fairly easy to implement. However, others may be a bit too technical for you. If that’s the case, please consult with your website developers. Also, to fully analyze your website, its loading speed, and many other possible errors that may be slowing it down, don’t forget to use our free SEO Site Checkup Toolbox.